"Everybody benefits." 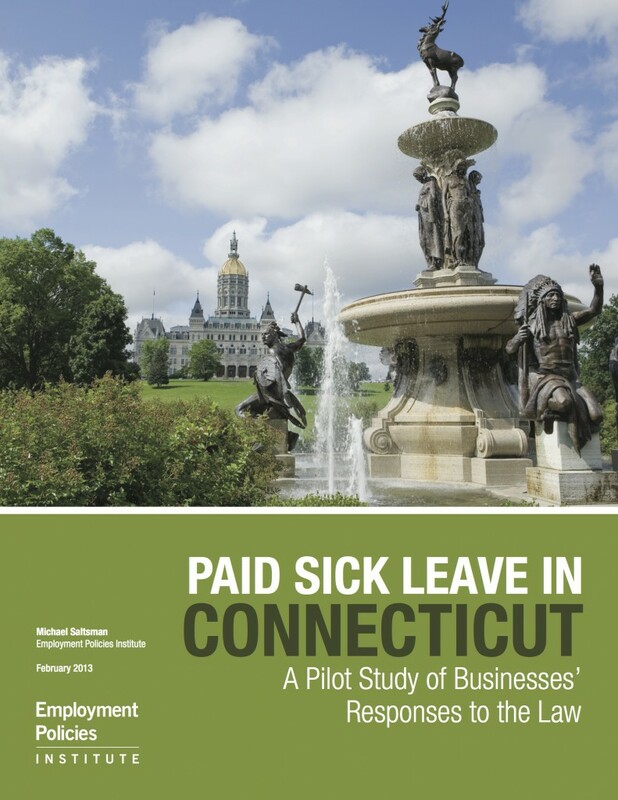 That’s what proponents of Connecticut’s first-in-the-nation state paid sick leave law told legislators and the public during the debate that preceded the law’s passage. Business owners weren’t so sure—public hearings on the legislation contained testimony from a number of businesses concerned about the effects of the law on their operations. The state’s sick leave law took effect at the beginning of 2012, and the point of this study is to capture businesses’ early experiences with and reactions to the law. Were the concerns expressed early on during the legislative debate worth considering, or was it just business owners “crying wolf ”? Between April and October of 2012, we surveyed a broad list of business owners provided to us by the Connecticut Business and Industry Association and Connecticut Restaurant Association, and conducted in-depth follow up interviews with four of the responding businesses. The results should not be interpreted as being representative of the experience of all businesses in the state, but indicative of some of the challenges that businesses in a wide range of industries have faced while implementing the law. Of the 156 businesses that responded to the survey, 86—or 55 percent—had started providing sick leave to comply with the new law. Prior to the law taking effect in January 2012, 31 of the businesses surveyed had scaled backed on employee benefits or reduced paid leave (or both) to account for the cost of the new law. Twelve had cut back employee hours, and another six reduced employee wages. Nineteen businesses raised consumer prices, six laid off employees, and three converted part-time positions to full-time positions. Sixteen businesses indicated they had decided to limit or restrict their expansion within the state. Perhaps more concerning were the future actions that state businesses were likely or highly likely to take in response to the law: Thirty-eight businesses said they would hire fewer people as a consequence. Other actions included offering fewer raises, scaling back on overtime, raising prices, and increasing the cost of other benefits like health insurance. Also surprising was the perception of the public health problem the law was intended to solve. Contrary to rhetoric used during the campaign, nearly 90 percent of all responding businesses indicated that sickness in the workplace was not a serious problem prior to the law taking effect; just 3 businesses described it as a serious problem. Employers were also skeptical of the projected savings from the law. Of the employers in Connecticut that started providing sick leave, only two responded that it would reduce employee turnover, and another two anticipated that it would increase employee productivity. Forty-six businesses worried that the law would increase unscheduled absences in their workplace. One of the companies surveyed already had experience with this phenomenon, where employees call out sick on Monday and make a “miraculous recovery” the following day. Perhaps most telling was that, of the 83 employers who responded to the question of whether the law was good for their business, 57 of them—or 69 percent—said it was not. A full accounting of the law’s impact will take additional time, and this study makes no claim of being representative of the broader Connecticut business population. But it does suggest that the law has not been a cost-free endeavor, and that there have been consequences for both employers and employees as a result. Other cities and states considering similar laws should take these consequences under consideration.